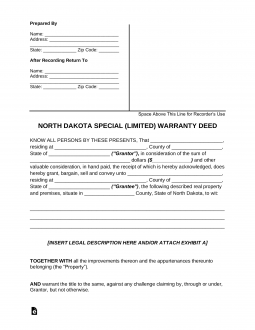 The North Dakota special warranty deed is similar to a general warranty deed because if comes with a guarantee from the grantor as to title. However, with a special warranty deed, the title is guaranteed only as to any claims that arise out of grantor’s ownership of the property. In other words, the grantor is guaranteeing that he or she has done nothing to encumber the title while he or she has owned the property, but the grantor is not guaranteeing anything they may have transpired with previous owners. Again, it is prudent to have a title search completed if you want to be sure of the interest that you are intending on purchasing. Step 1 – First, fill in the grantor’s name and address and whether or not he or she is married. Step 2 – Write in the amount of consideration paid for the property. Step 3 – Next, include the name of the grantee and the address of the grantee. Step 4 – Check the box indicating how grantee intends on owning the property. Step 6 – Fill in the previous deed information and have the grantee check and sign the consideration certification. Step 7 – The deed should be signed and dated as indicated and acknowledged by a notary public. Step 8 – The grantee should take the original deed to be recorded with the recorder in the county in which the property is located.